This hair accessory, like some of my others, is not for the faint of heart. 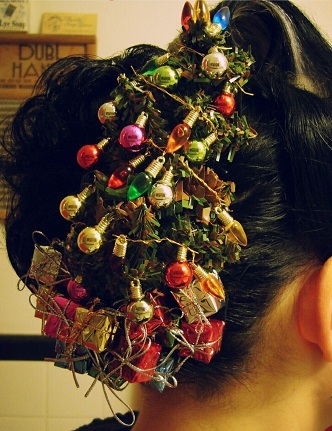 You will be wearing a Christmas tree in your hair. Literally. If you are ok with that, then let’s get started! First, I had to find a tree small enough. What an odyssey that was. 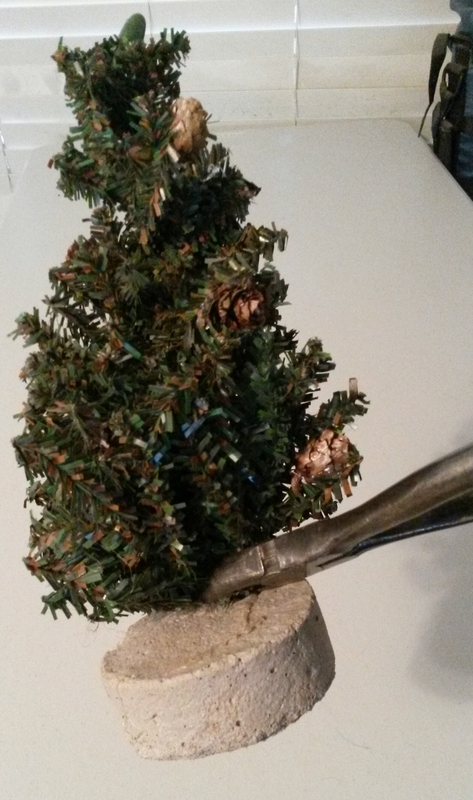 Of course manufacturers of these little hobby trees are making them for home display, or office holiday cheer. Not hair. So I bought the smallest one I could possibly find, and disassembled it. It had a cement stand! 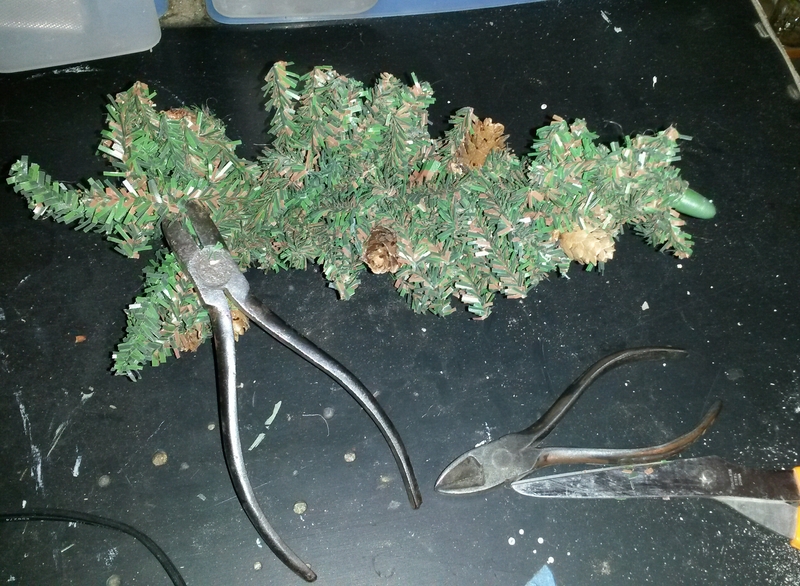 Then I had to use wire cutters to dismember the poor thing. It was far too heavy. I needed fewer limbs and a flat back so I could lay it on some felt, and ultimately, on my head.. It took two different types of wire cutters to get through this bad boy! 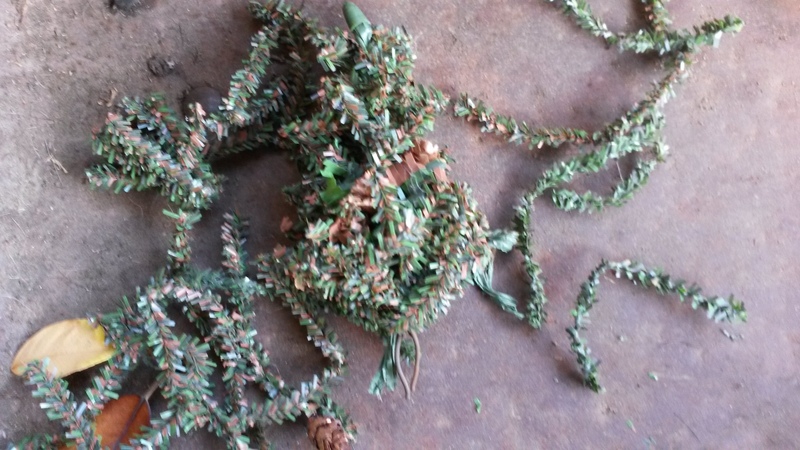 It needed to be thinned out, A LOT. Once that was done, I could start decorating. 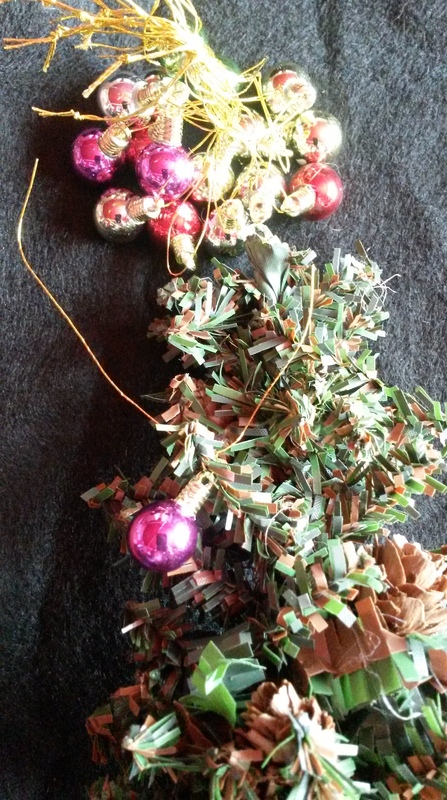 First to be added were the ornaments. I tied them on, one by one, strategically placed. Then came the lights. I couldn’t find dollhouse lights that had a battery pack light enough for my hair to support the weight, so unfortunately, they don’t actually light up. Disappointment. 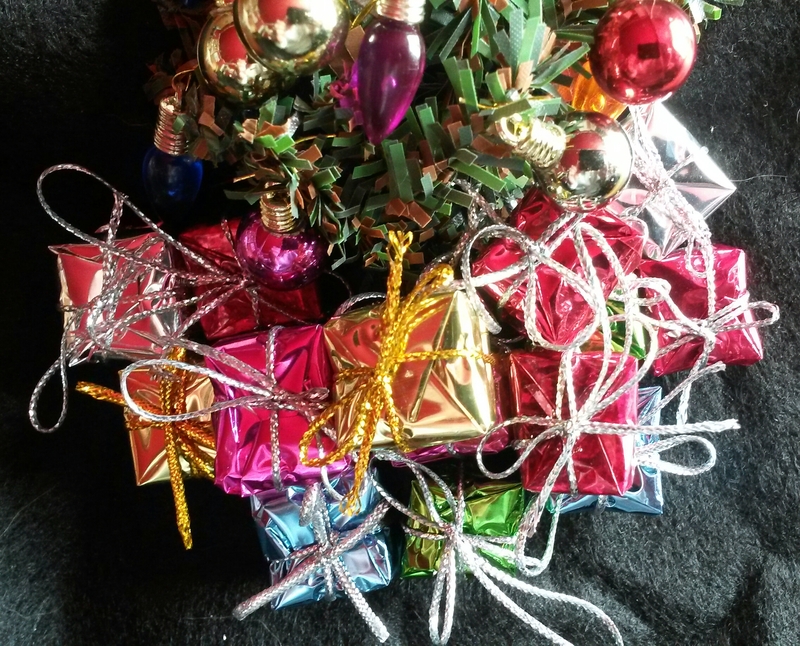 And what is a tree without gifts? I laid the tree to the felt and glued the gifts onto the felt and the bottom of the tree. Cut the felt, add the duckbill hair clip, and it’s done! 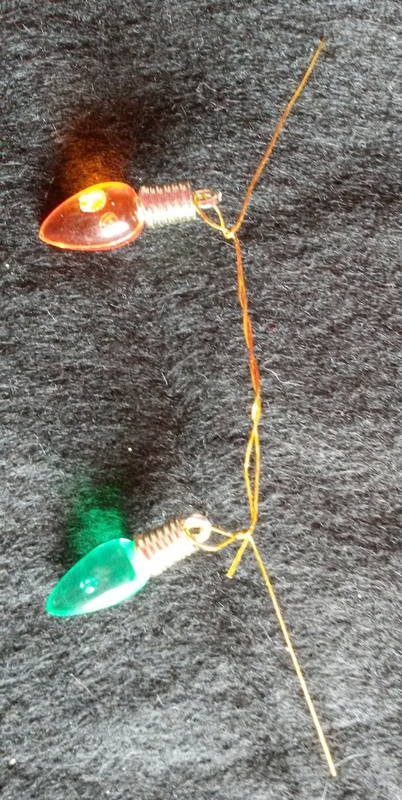 I could not find a small enough angel for the top, another item for the search- along with working lights. 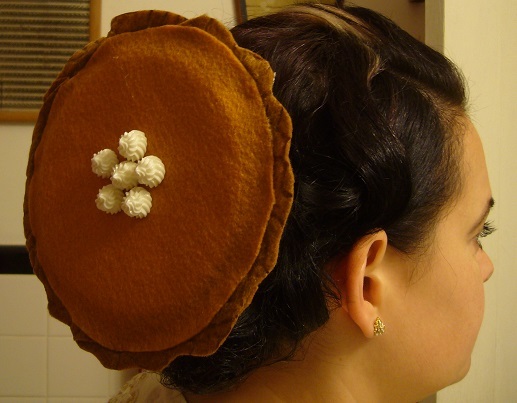 Now you have to decide how you will wear your hair to best accent (and support) your newest accessory. Now, be prepared to take a bit of blowback from your friends and passerby. 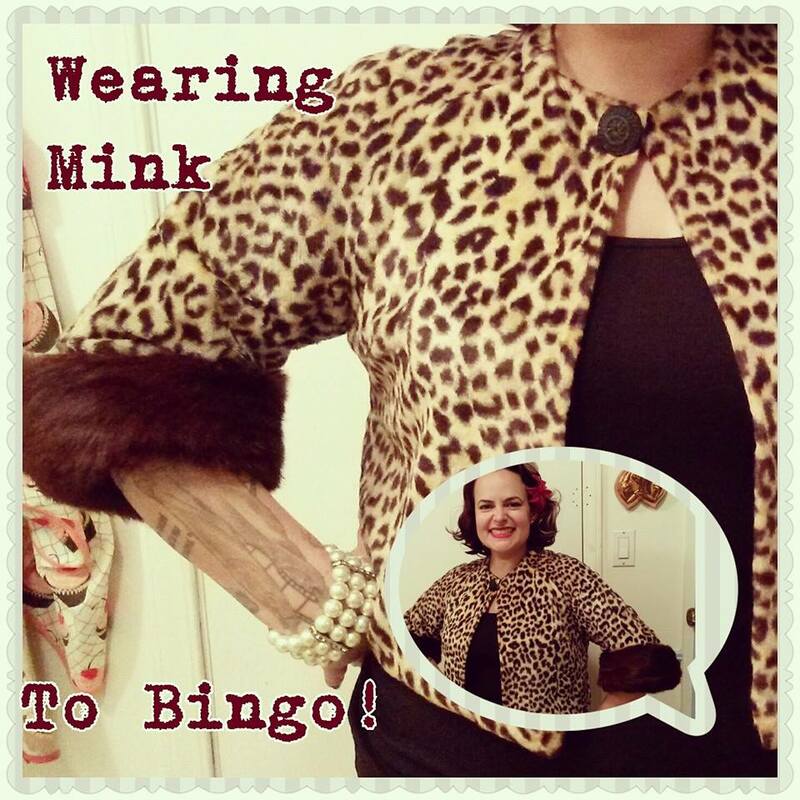 You are after all, taking a fashion chance by wearing this piece of glory. Others of a lesser station may feel the need to say something snippy about your choice of accoutrement. Just tell this riffraff that you love your style and will never compromise. Period. p.s- don’t forget to at least tidy up your living room before leaving the house this holiday season. You never know who may be dropping by with good tidings. I have been asked many times about my unconventional hair accessories. The coffin, the vegetables, the party umbrellas….how did I make them? So when I went to start my latest project, pumpkin pie, I took notes. The idea came from one of my clients, as we were discussing what food (fake food that is) I could use for my Thanksgiving accessory. I couldn’t find a fake turkey leg to save my life, so my client said “hey, pumpkin pie!” Oh yes. Two types of felt, a pie tin, craft foam, fake whipped cream, (thanks to Etsy) and I am on my way. Now for the “crust.” I cut the edges wavy and glued it to the pie tin as if I had laid in an actual crust. I then added the foam inside. Now to add the “pumpkin” overlay. Can’t forget the whipped cream! Just a few dollops. Now the hard part- how to attach it to my hair??? 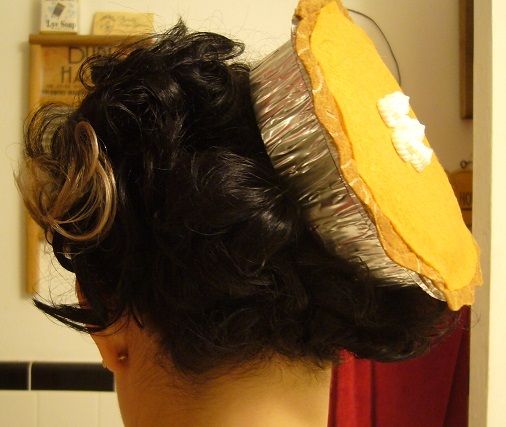 My usual duckbill clip won’t work because the bottom of the pie tin is totally flat. It will be lifted on that side if I use one of these. So I decide to go just with bobby pins, which is as flat as I can get. 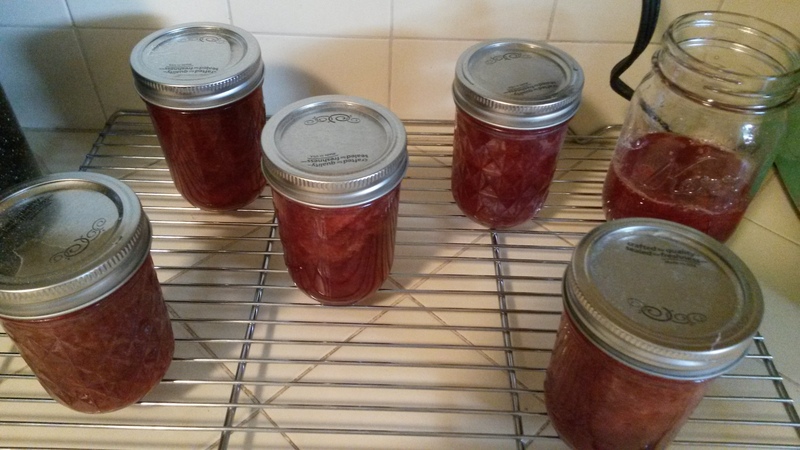 As one starts to pickle, she begins to feel more brazen about canning. Maybe death isn’t imminent from ptomain poisoning. Maybe I can do this! What else can I try? For me the next step was jam. 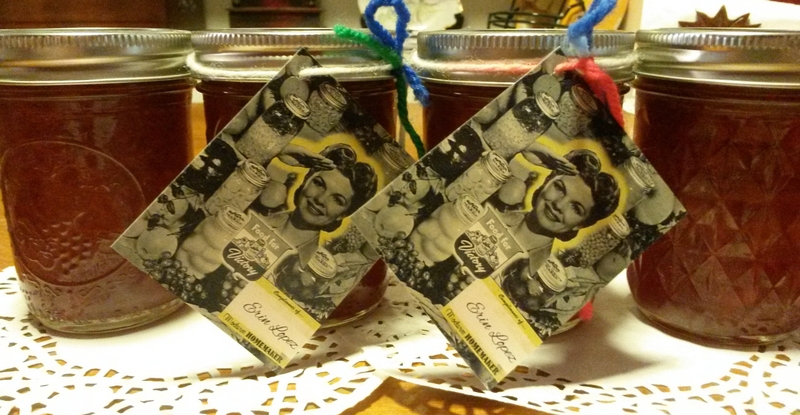 Hubs grandmother has given us her jam before, and it is always so tasty. 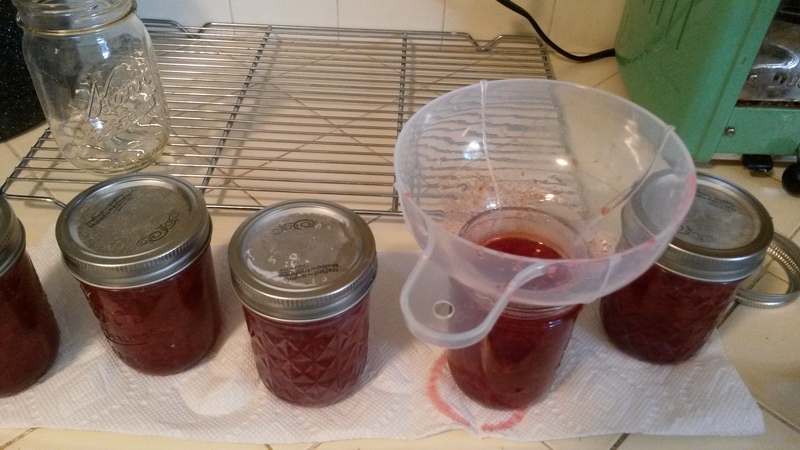 I find an age old recipe for strawberry jam that is not too intimidating, where else? The Farmers Almanac! 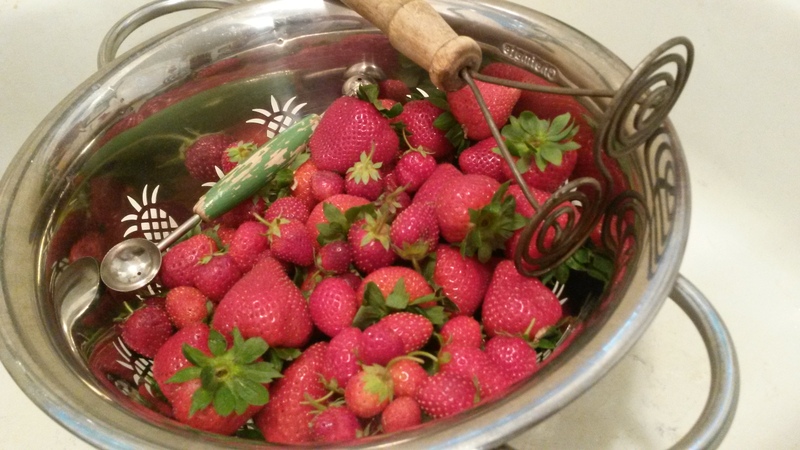 We grow a small crop of strawberries in our Victory Garden, so the first step is to harvest what I can, and I purchase the rest. 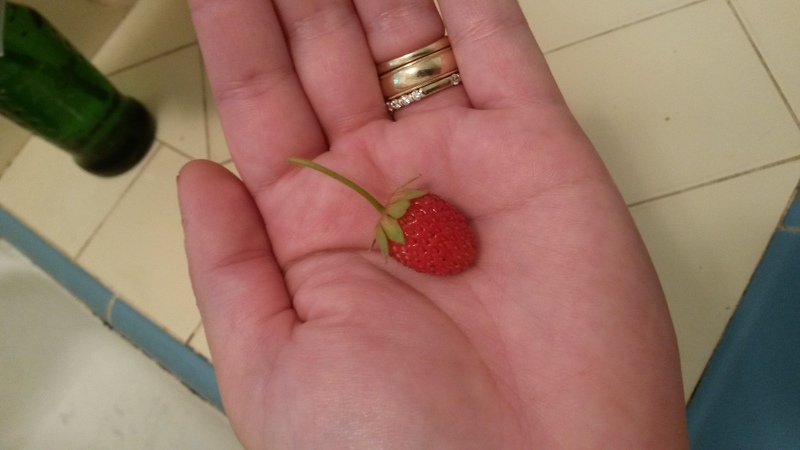 These lilliputian strawberries are my favorite. What they lack in size they make up for in cuteness and perfect shape. They need to be hulled and mashed. I have a lot of old kitchen utensils that I love to use. That is actually an old potato masher. Thanks Mom! 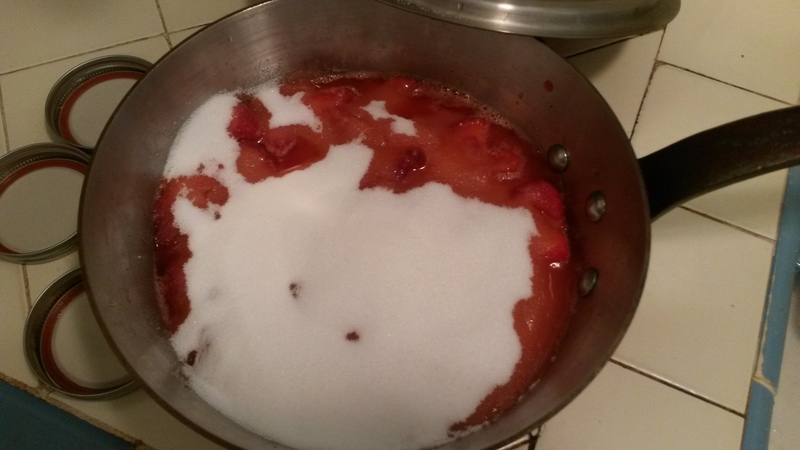 Next we mix in the sugar and cook the fruit mixture. Mmmmm, healthy! 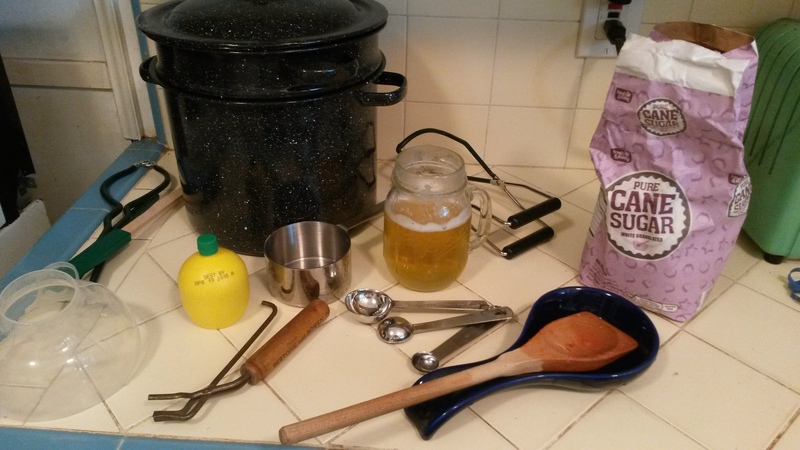 Now we use all the canning equipment and other ingredients. This includes the most essential piece-the beer. This does not go into the jam. This goes into my mouth. We have been sterilizing the jars to prevent death. 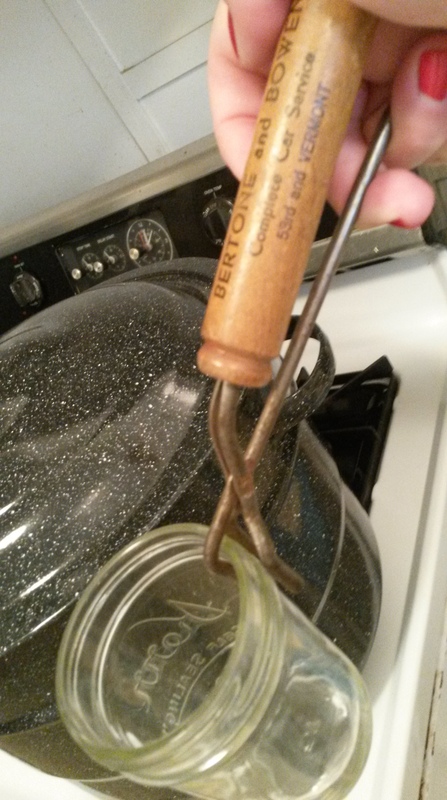 This is the new jar grabber that came with my canning kit. This is my old one. It was a promotional item given away by the garage Bertone and Bowen, complete car service. Fun stuff, right? Now the fruit is cooked, the jars are sterilized, and it is time to rush the concoction into the jars and the jars into the canning bath for 10 minutes before they become contaminated by some sort of deadly virus. 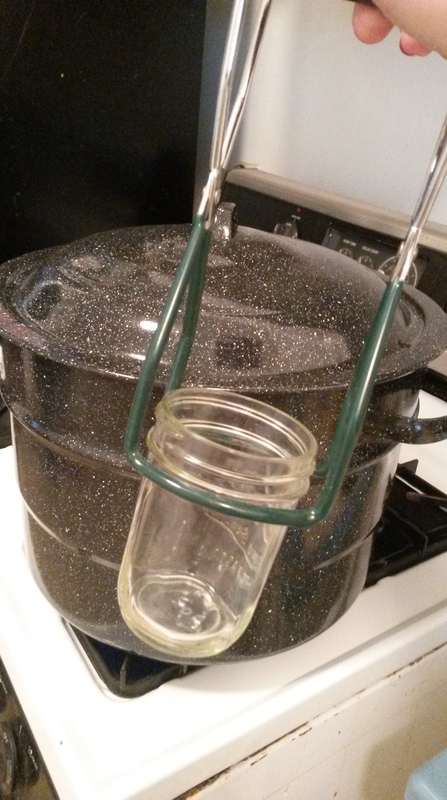 Man, those canning people sure scare you when it comes to sterilizing! I’m all about it, but the Black Plague part scares the you-know-what out of me! Now it cools and you anxiously await the POP! I anxiously await 5 POPS! actually. The wait is long, as this fruit is incredibly hot! I steal a canning label from a World War 2 propaganda poster about canning and make it my own. 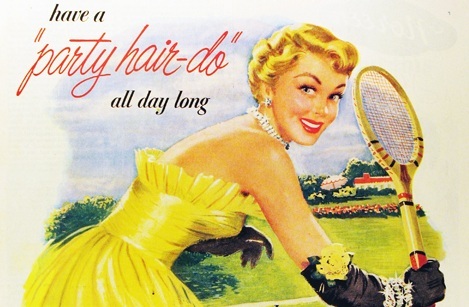 After 60 years isn’t it public domain anyway? And voila! Jam! Making jam was kind of like making pickles or dilly beans. Sterilizing, cooking for 10 minutes, cooling…….now that I have the hang of it, who knows? p.s- if your jam is a little runny, add a bit of Sure Jell next time.